Hello my fellow Bead-Weaving Wiz’s! Leah here again with Eureka Crystal Beads! Are you ever searching for faster ways of doing things? (Note: faster doesn’t always mean better, but in this case it can!) 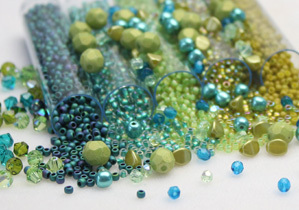 Or do you look for interesting ways to change up a traditional bead stitch? Today I’m going to show you some easy variations from standard even-count flat Peyote stitch. First, let’s do a quick review of basic single-drop even-count flat Peyote. (If you’d like to watch my video on this, head over to YouTube!) In the images here, you can see how I’ve loaded an even amount of beads (in this case, 6 Toho size 8/0 seed beads). To start my basic Peyote stitch, after the 6th bead has been loaded, I’ve turned around to back in the other direction, picking up 1 bead / skipping over 1 bead as I go. What we see here is the most basic version of Peyote you can do. Now, let’s take a look at 2-drop even-count flat Peyote! Once you get beyond single-drop peyote with an even number of beads, you need to think less about the number of beads and more about the number of UNITS. So in the case below, I have 4 units of 2 beads. This is important to note because, had I loaded on a total of 6 beads (which would be 3 units), I wouldn’t be able to do even-count 2-drop Peyote because I need an EVEN number of UNITS (since we’re treating them as one bead when we stitch) and “3” is not even. So after 8 beads are loaded, I’ve turned around to back in the other direction, picking up 2 beads / skipping over 2 beads as I go. Starting to make sense? This is a great way to get a peyote stitch project to work up much quicker! Next, we’ll take a look at 3-drop even-count flat Peyote. Again, as with 2-drop, we need to be more focused on the number of UNITS rather than the number of beads. Below, I have 2 units of 3 beads each. As long as the unit number is even, we’re good to go! So after 6 beads are loaded, I’ve turned around to back in the other direction, picking up 3 beads / skipping over 3 beads as I go. In this instance, because I’m only making my piece 2 units wide, it works up VERY quickly!! Previous Post Finding your Inspiration in Nature! Next Post Project: Fun EASY Rivoli Bracelet! Peyote stitch is one of those basics that always looks good, and I keep going back to it. You can lots of variations with 2 and 3 drop versions. I love Eureka Crystal Beads! This is my go to site, for quality, quantity , price. The shipping is bananas, they tell you when it shipped, give you a tracking #,and tell you when it has been delivered to your mailbox! No more anxiety about watching the mailman everyday.